Simultaneously embedded in the landscape and floating in the air, WindNest is a macro scale land art installation that harnesses wind and sun energy for performative effects. 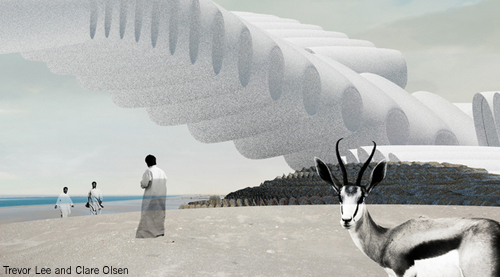 The multi-stranded system grows from the subtle dunescape at the site, allowing for raised viewing platforms as well as erosion protection and habitat corridors. Hovering above and on the verge of take-off, a network of windsock turbines dynamically registers wind movement across the field, producing both energy and atmospheric effects. The pragmatic, performative aspects of WindNest are provided through two means of energy collection. One third of the windsocks are covered with solar fabric. 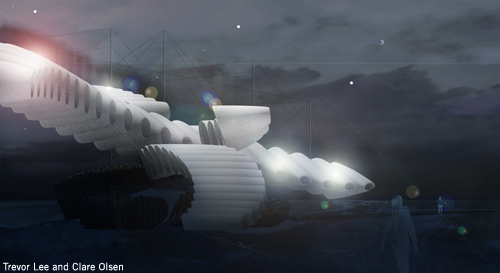 In addition, each of the windsocks is fitted with an energy collection turbine. 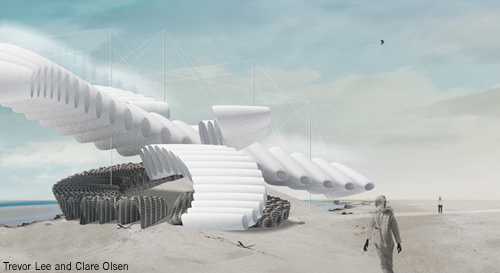 The proposal utilizes low-impact, lightweight materials chosen in consideration of the full life-cycle of the project from material production to construction, maintenance and even after its role as a public art installation. Although the project covers a large area creating a big visual impact, the effects are achieved through humble means. The nested elements are intended to be hand-woven by local craftspeople. Utilizing regionally harvested materials and human resources, the project proposes to engage the local craft economy, using natural materials and minimizing shipping, contributing to a low environmental footprint.